Fig. 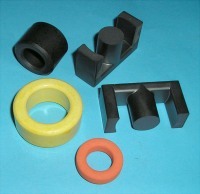 1: Various magnetic cores. The magnetic hysteresis loop reveals a lot of information about the properties of core materials used in coils and transformers. They indicate how high the core power losses are, what the maximum modulation may be and gives information about the drive dependent permeability. In the article Measuring Permeability can be read how the permeability must be measured. Before any measurement can be done, first the physical characteristics like the cross sectional area of the core Ac and the length of the magnetic circuit must be known. The article Magnetic Circuits shows how to obtain these properties. The hysteresis loop is drawn by plotting the magnetic field strength H against the magnetic induction B in the core material. This magnetic field magnetizes the core material. This phenomenon is called magnetic induction B, also known as the magnetic flux density. The degree of magnetization can be measured directly by a hall-sensor. However, to bring a sensor in the magnetic path, the core has to be opened. This will cause a serious change of the permeability and makes a reliable measurement impossible. The magnetic induction can also be measured without tampering the magnetic circuit. The generated EMF in the windings is proportional to the flux change dΦ within the core. 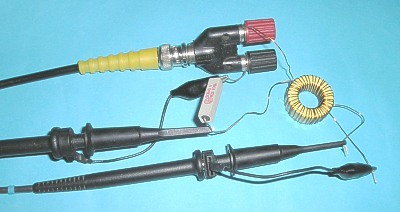 The core under test must be provided with two windings. The first winding is fed with an alternating current. This current I is directly proportional with the field strength H. The second winding is used for measuring the voltage E and the induction B is derive therefrom. The measurement could also be done with a single winding on the core, but the voltage drop over the internal resistance of the winding caused by the current would introduce a measurement error. An another advantage by using a dual winding is that it simplifies the current measurement. This measurement can be done as well with an analog as a digital oscilloscope. A digital oscilloscope is preferable because the exact hysteresis losses can be calculated. By using an analog oscilloscope the losses can only be estimated. If a measurement is done on a splittable core, the faces of the core halves has to be cleaned carefully. Any dust particles or hairs will create an air gap and affects the measurement in a negative way. The core halves must be clamped firmly against each other. Fig. 2: Measuring arrangement of the hysteresis measurement. To prepare the core under test two windings of equal turns has to be laid on the core. So N1 = N2 = N.
A function generator whose top-top voltage and impedance is known powers the made transformer. E.g. : 15 Vtt / 50 Ω (with a 50 Ω load). The open terminal voltage is therefore also 15 Vt, and the maximum current is 15 V / 50 Ω = 300 mAt. A normal drive amplitude should be feasible at 10 % of the maximum output of the function generator. The top-current IL in this example is than 14 mA. The voltage over the winding VL has to be approximately 100 mV at a flux density B of 100 mT. Especially cores with a low permeability need a large number of turns. To reduce this large number of turns the drive signal can be boosted with an audio amplifier. So a larger drive current is available. Connect in series with the amplifier a power resistor with a value of 4 Ω to protect the amplifier. Calculate the number of turns again now with the current the amplifier can deliver. The shunt resistor R must have a value of 1 Ω if a function generator is used. This results in a voltage of 1 V per ampere. If an extra amplifier is used adapt the resistor to the larger current. In the following measurement circuits is a capacitor C added to output of the function generator. This is only necessarily if there is a DC-voltage present on the output. To calculate the flux density B the coil voltage VL must be integrated. In the circuit below where an analogue scope is used, an opamp integrator fulfills this tasks. Fig. 3: Hysteresis measurement circuit with an analog oscilloscope. The resistor Ri has to be much smaller (factor 1000) than the resistor Rn of 10M, but also much larger than the internal winding resistance of the secondary winding. A value between 1k en 10k is most of the times suitable. The 10M resistor prevents a runaway of the opamp output voltage towards the positive or negative supply voltage as a result of integrating the input offset voltage. To prevent clipping use a low input offset voltage opamp like the TL051. It's unlikely to find a capacitor with exactly this value. A solution therefore is to make the integrator resistance adjustable, so that it meets the condition: Ri·Ci = Ac·N. The flux density can now been read with a sensitivity of 1 T/V on the Y-axis of the oscilloscope. Caution! The secondairy winding has an inverted polarity relative to the primary winding. This is done because the integrator also inverts. The two diodes protect the input of the opamp against excessive voltages. A diode like the 1N4148 who has a low capacitance, low leakage and is fast would not disturb the measurement. Use never slow types like the 1N400x. Fig. 4: Hysteresis measurement circuit with a digital oscilloscope. When a digital oscilloscope is used the coil voltage could be digitally integrated. Of course the scope must therefore have the math options including integrating signals or the scope must be capable to transfer acquisition files to a computer for further processing. In this case the measurement circuit in figure 1 can be used. The integrating of the secondary voltage yields a turn dependent flux in V·s. In the X-Y mode the field strength H is plotted on the X-as, and the flux density B on the Y-as. Adjust the scope settings so that the hysteresis loop appears on the center of the axis. De hysteresis losses are simple to determinate by multiplying the measured voltage and current and than measure the total energy over on full period over the resulted power curve. The measured voltage over the shunt resistor R must first being converted to current. Fig. 5a: Processing measure data with Mathcad: Define core parameters and the number of windings. Read the voltage and current data from the files. On the right the graph with the measured voltage and current as a function of time. First the properties of the core are defined: cross sectional area of the core Ac, magnetic length lc, and the number of turns N.
Then the voltage and current data are read. These are .txt files that contain as well the time as the amplitude information. From the files are the time and amplitude distilled and defined. Now these voltage and current lists are plotted and show the same shapes, as they were visible on the scope. Fig. 5b: Processing measured data with Mathcad: Define the beginning and end time period, interpolate voltage and current, calculate the field strength and flux density. On the right the calculated field strength and induction are plotted in a graph. The data must be interpolated for further processing. The start time Tstart and the period time Tperiod must be specified. These numbers can be adjusted so that the hysteresis loop will show in the center of the graph and covers one full period. With these numbers the end time Teind is calculated, and the interpolation interval ΔT is set. This results in the voltage over the coil V(t) and current through the coil I(t) as function of time, which can be further processed. The field strength H(t) and the flux density B(t) can be calculated. The hysteresis loop can be made visible. Fig. 5c: Processing measure data with Mathcad: Calculating the energy losses. The energy losses E at running through a single hysteresis loop can be determinate. As a last calculation the dissipation Ph(t) owing to the hysteresis losses at a frequency f of 100 kHz. The hysteresis measurement can be done at different drive amplitudes. By doing this the non-linear increase of the hysteresis loss with increase of the drive amplitude is made visible. Fig. 6: Hysteresis loops from the Ferroxcube 3C85 material at different drive amplitudes. This measurement is done on three different drive amplitudes on an EDT39-3C85 core. Table 1: Measured energy and power losses. The hysteresis loss of 1.27 W @ 100 mT & 100 kHz is a normal value for a core of this size. Especially striking is the vast loss increase at larger drive amplitudes. Even at a flux density of 0.24 T and a frequency of 100 kHz the hysteresis loss is already 8.65 W. This is a way to high power to prevent a thermal overload. The drive amplitude of 0.42 T approaches the saturation induction. Because the measurements are done at a relative low frequency, extreme heating of the core will not occur. The core characteristics are also temperature dependent. The previous measurements are all done with an alternating current and a resulting pure alternating magnetic field in the core. Many magnetic components are subject to a direct current as in filter coils in switch mode power supplies. It requires a different measurement protocol to gain the DC-characteristics. This makes it also possible to measure the initial magnetization curve. Just because of the hysteresis, magnetic materials have the property that a remaining magnetization is left behind after removing the external magnetic field. This effect is known as magnetic remanence. Because this remanence magnetization will disturb the measurement it has to be removed before any measurement is done. This degaussing of the core is done with an alternating current with an exponential decreasing amplitude in time. After degaussing the actual measurement will follow. The figure below shows an example of a signal that is fed to the primary winding generated with an Arbitrary Waveform Generator. Fig. 7: The core has to be degaussed prior to the measurement. With this kind of measurements it's important that the direct current trough the primary winding is well defined. To prevent ringing on the drive signal, which will disturb the measurement, the signal is boosted with a current amplifier. The circuit below shows such a current amplifier build with a L165 power opamp. Fig. 8: Circuit for the hysteresis measurement with a DC current offset. The mentioned supply voltage is a typical value and can be adapted to the needed requirement. Both channels of the oscilloscope must be DC-coupled. Ensure that the scope can trigger at the start of the actual measurement signal, so that only this part is fully visible. The degaussing process isn't interesting for the measurement and can left out. The measurement frequency of the signal during the measurement impulse must be kept low in order to reach the desirable measurement current. This prevents also an unwanted heating of the core. A measurement frequency around 500 Hz for small cores is suitable. Larger cores are generally measured with a lower frequency. Switch mode power supplies can work in two modes: continues-current and discontinues-current. In this example the effect on the core losses and permeability compared between these two modes are measured. Table 2: Argumentation measurement parameters. This scenario is based on a same average current Imean and the same core for both modes. The current in discontinues current mode travels between 0 A and 2·Imean, → ΔI = 2·Imean. In the other mode, continues current, the ripple current ΔI is chosen twice as low. The self-inductance must therefore be twice as high, and the number of turns is therefore √2 larger. For both situations applies: the peak current is equal to the average current plus the ripple current. The maximum field strength is proportional to the product of the number of turns and the peak current. The result is that the field strength of a coil in continues current must be 1.5/√2 = 1.06 higher. Because this difference is so small, the current for both measurements is kept the same. Table 2 lists the arguments for the measurement conditions. Fig. 9: Voltage and current waveforms of the hysteresis measurement with offset. The degaussing prior to this measurement is not visible. Both measurements are done on an EDT39-3C85 core with 49 turns for both the primary and secondary windings. Figure 1 shows the scope screen from the while the measurement was taken place on the coil in continues current mode. The measured waveform of the digital oscilloscope is downloaded to a computer for further analyzes. The shown hysteresis loops are taken from the full waveform as where visible on the scope. For the calculation of the core losses one full period was selected. The results of the two comparative measurements are shown below. Left the hysteresis loop in continues current mode, on the right the loop in discontinues mode. Fig. 10: Hysteresis curve of an inductor in continues current mode. Fig. 11: Hysteresis curve of an inductor in discontinues current mode. Table 3 shows the measured values: The flux density difference ΔB and field strength difference ΔH of the hysteresis loop, the relative permeability in the area of the loop μr (= (ΔB/ΔH)/4·π·10-7), the energy loss per cycle and the power loss at a frequency of 100 kHz. These numbers makes it clear that the core hysteresis losses in discontinues mode are striking higher (2.7 times) than in continues current mode. Fig. 12: The drifting of the hysteresis loop caused by an offset error of the oscilloscope. There will always be a certain amount of an offset voltage been measured if an oscilloscope is used. Most often it's very small. But because the measured voltage is integrated also the (small) offset voltage will be integrated. This will result in a runaway hysteresis loop as shown in figure 12. It is therefore recommended to measure the mean value without signal directly before and after the hysteresis measurement. This measured offset value can be included in the calculations. If the measured offset value is unreliable, the value can be determined empirically, so that the loops will lay over each other.